Forest Adventures is the perfect team-building retreat for schools. Whether you simply want a fun day outside or if you are looking for particular requirements such as team building, we can tailor a visit to suit your needs. 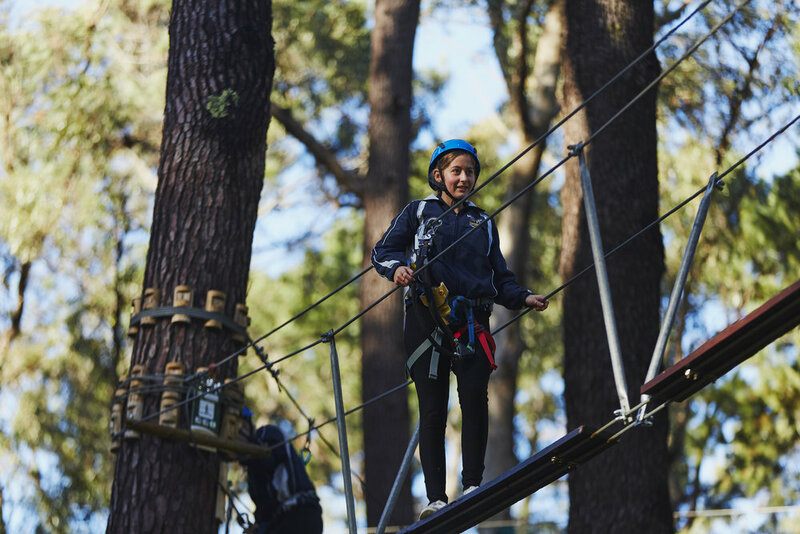 Advance initiative, problem solving and communication skills with the high-rope adventure course among the beautiful tuart and pine trees in the historic Ludlow Tuart Forest. The 77 activities spread across six courses of varying height and difficulty are designed to individually challenge, improve confidence and provide a high sense of achievement together with a lot of fun, thrills and adrenalin. The courses are paced, starting off at just 3 metres and working right up to 19 metres above the forest floor. The aerial activities increase in difficulty; getting wobblier, longer and more challenging as the student progresses. A buddy system can used to develop relationships, confidence and communication. Students of all ages (from 7 years old) and abilities are supported by trained instructors ensuring a fun, safe and rewarding experience. The 15- lane archery range is designed to develop concentration, patience and perseverance. Students challenge themselves individually, contributing results to a team contest. The instructors teach techniques to improve accuracy and distance with a recurve bow. As student’s confidence and skills develop the shooting distances can be extended to a maximum of 15m. Designed so that students learn the fundamental skills of how to work together to achieve a common goal, our team building sessions include a variety of activities specifically tailored to each group. One of our most popular and successful activities is the Aqueduct. In Aqueduct students work in small groups, constructing a 20m aqueduct, delegating roles and responsibilities and using their communication and problem-solving skills to build their aqueduct. They are faced with turns and obstacles where they must apply the laws of physics for it to pass a series of milestones. Stage one has the group in many teams, then to the surprise of the participants, they are required to work collectively, needing to connect their aqueducts together to make it work! The aim of the game is to distribute water, or in the inside version marble balls, along the pipeline, from Point A to Point B. Students learn the basics of orienteering as they make their way around a course set throughout the Tuart forest and historic Ludlow settlement. At the beginning of the session students are taught how to use a compass, including orientating a map to north, taking and finding a bearing. In addition they are shown how to find North without a compass, using trees and the sun. Once the students have mastered the use of their compass, its team against team as they make their way around the course using the bearings on each marker to find 3 different team challenges, that will test their team work, memory and lateral thinking. An interactive and fun session where students build their own bush shelter while learning essential survival skills for the Australian outback. Students are split into small groups, where they work as a team, learning to delegate roles and responsibilities to build their shelters. Upon completion, the groups come together to prioritise needs, learn how to purify water, light fires and basic first aid. Session lengths can be varied to suit group needs. All activities are fully supervised by our staff who all have current working with children checks. Our high ropes course uses an advanced safety system allowing students to make their way around the park independently. More information on our safety standards. WHAT IS THE MAX. WEIGHT? We welcome all students to participate in our activities. Some students who have learning or mobility challenges will require different staff supervision ratios. Please contact our friendly staff to discuss your needs.